It is finally almost Friday, thank the good Lord. What Friday means to the working girl is relaxation. 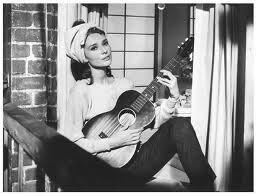 My Weekend Inspo comes form this legendary Audrey look from Breakfast at Tiffany’s, particularly when she is sitting in the window singing. What is she wearing? A great French Terry Crew and simple jeans, head wrapped up, make up on low. This look couldn’t be more perfect for the working gal on her day of rest. Some of my spring favorites just happen to be thrift store finds. My motto for the spring is simple, comfortable and fabulous. My favorite way to make a statement is by pairing a key item with a simple tshirt. 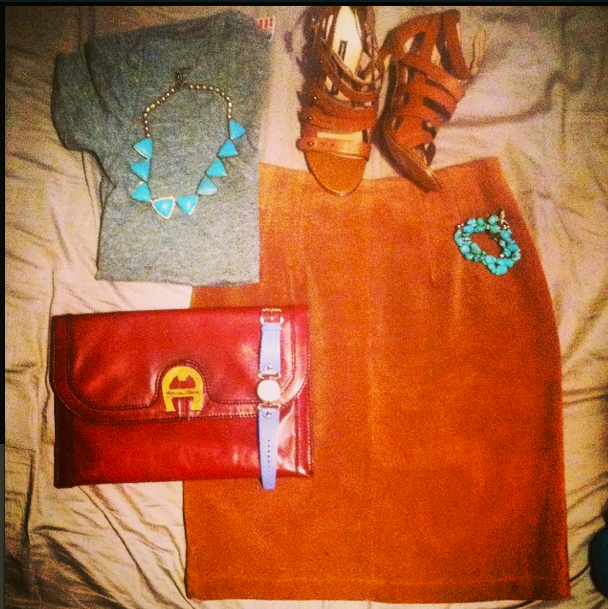 The perfect friday outfit for me includes this vintage pecan leather mini and a simple grey trebled tshirt. Finish this look with a strappy pump from French Connection and a bunch of turq earthy jewels, and you have yourself a timeless look that is fashion worthy. Basic Fab is my spring motto, whats yours? simple style is updated with classic vintage pieces and fun pop jewelry. FASHION MOMENT- SPRING 15 INSPO.